We are writing this open letter to you in your capacity as Head of Development Management for the Snowdonia National Park. As you will know from our earlier objection letter we are opposed to the proposed Hydro Scheme on the River Conwy. Earlier, through the online petition (https://you.38degrees.org.uk/petitions/stop-the-damming-of-the-river-conwy) we became aware that a manager at Dulas Ltd (one of the contractors involved in the bid) was trying to influence public opinion through leaving a comment on the petition. If you haven’t seen it we have included a screenshot of the comment below, with a link to the page it was on, as an appendix to our letter. As this individual had failed to provide any information of his interest from a commercial point of view while making his comments, this led us to wondering if there had been other instances of this during the planning application phase. We were helpfully assisted by your planning department who gave the names of all those who had written to you in support of the scheme, and have spent some time looking them up on LinkedIn. For your information we have included the list below, along with the positions they hold either in either RWE or Dulas Ltd. There are others on the list that can also be traced back to either of those companies, or have been contracted by them to assist in their application. All of this information, along with the links for verification is below. 1: They work for Dulas Ltd or RWE, or have could have been contracted by them. 2: It is unclear whether they have set out in their letters that they work for either of the above companies or have declared their apparent professional interest. 3: When people write in support of projects in which their employers have a vested interest, it is very difficult to know what influence (proper or improper, direct or indirect) has been put on them to write. 4: I would suggest this leads to a natural conclusion that these particular letters of support require treating with an appropriate amount of caution, as it seems clear that their provenance is in doubt. We trust that you will see the seriousness of the situation, and ask that you provide assurances that this information is acted upon with the utmost urgency. 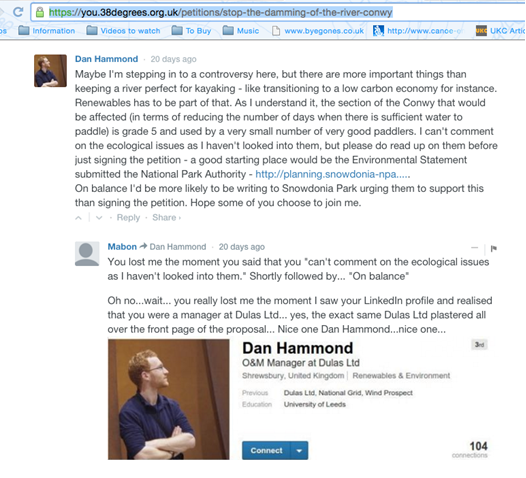 Appendix 1: Screenshot of comments left by Dan Hammond (Dulas Ltd Employee) on the petition page in the comments section.